It's easy! It's fun! 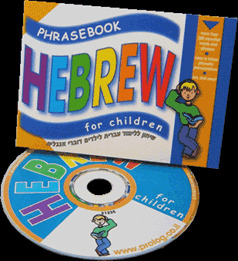 Each phrasebook contains 160 words, sentences or expressions suited for children. Each Hebrew sentence or expression has its own colorfully illustrated page, including transliteration (the Hebrew word written in English letters to make it easy to pronounce). All the material in the phrasebook is read aloud slowly on the accompanying CD, to help children learn, repeat, and talk on their own!